Invokana Injury side effects lawsuits on the rise. As the number of patients afflicted with diabetes continues to rise in the United States, so do the risks of serious Invokana Injury side effects from the popular diabetic medication. Invokana Injury side effects. Johnson & Johnson and it’s Janssen subsidiary are exposed to allegations that the companies failed to adequately research the potential side effects of Invokana, and failed to warn about severe side effects from its blockbuster line of new diabetic drugs. Johnson & Johnson and it’s Janssen subsidiary are exposed to allegations that the companies failed to adequately research the potential side effects of Invokana, and failed to warn about severe side effects from its blockbuster line of new diabetic drugs. Invokana Diabetes Amputee Lawsuits. Michael Nickels recently filed a product liability and personal injury claim in the U.S. District Court for the District of New Jersey over claims of amputation as a result of taking the diabetic medication. Invokana Diabetes Amputee Lawsuits. 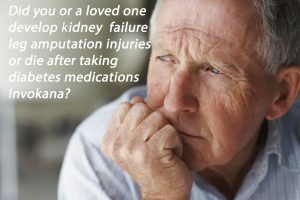 Invokana linked to kidney failure, leg amputations, and diabetic ketoacidosis according to lawsuits. According to Nickels, Johnson & Johnson, the world’s largest pharmaceutical company, and its Janssen Pharmaceuticals subsidiary knew or should have known about the potential amputee side effects of Invokana, but withheld and hid information from patients and doctors about the severity of the amputee risks.